Lorenzo the flying french man isn’t really flying. Lorenzo is a mind-blowing horse whisperer. Lorenzo was born in born in Les Saintes Maries de la mer. This frenchman has been performing horse show in crowds since a very young age and demonstrates incredible skill and control with his team of stunning grey Lusitano horses. The French Man’s breath taking performances and increasing popularity has led lorenzo to perform in many prestigious venues including the World Jumping Championship in Calgary. Lorenzo also performed roman riding at the Hanoverian Elite Horse Auction Gala Night at Verden Germany on October 2003. 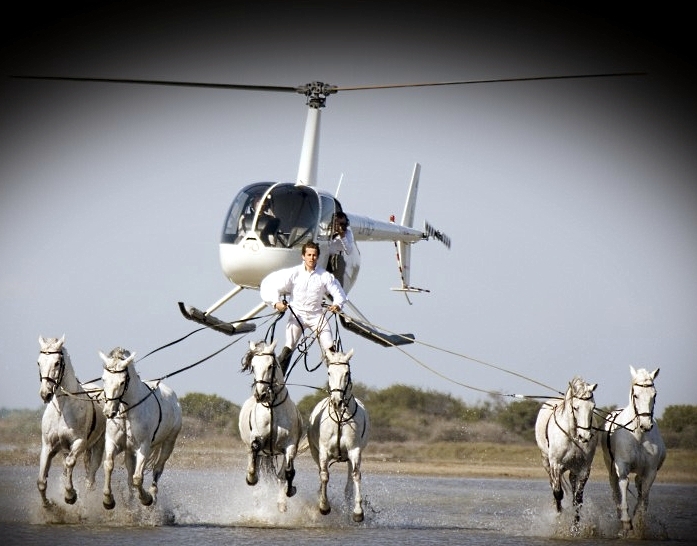 Lorenzo the flying horse man’s fantastic stunt riding and tricks includes standing at the back of his 6 stunning grey Lusitano horses and jump fences at the same time, flying over a series of jumps which stuns the audiences to the edge of their seats. Lorenzo the Flying FrenchMan will be performing at Cadre Noir this weekend. See more of upcoming events at Cadre Noir . this is one awesome video, horses and trainer. Hope he comes to US. He and his horses are unbelievable. Have watched many times. Does anyone know how I can see Lorenzo and his horses in a show or a workshop either in the US or France? Wow, Im so impressed with lorenzo’s talent. He can easily command his 6 Lusitano Horses. I like to buy his flying horses. I think he is better than Zorro. Nice Post.